With the move to recession gardening to save money and the surge in gardening across the United States and other countries its time to take into consideration what you can grow in your backyard. You can also buy locally grown organic fruit and vegetables in which you know there have been less or no chemical used on the produce. Another area that is often overlooked is looking in you own backyard for what’s green and growing naturally. You will be surprised how many natural herbs and other foraged items you can gather. Wild onions, wild carrots, and strawberries are only a few. You can also make you own tea blends that have twice the flavor of store bought teas. There are many wild edible herbs that grow in your yard. I use dandelion in the spring and also harvest cattails, both of which I have a large supply. You may also have elderberry bushes, wild raspberries or blackberries too. It’s time to take a good look at your yard, evaluate what you have and plan for the future. One of the easiest steps is to add a garden. This will give you fresh produce this season. 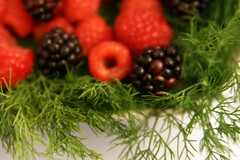 You can also look for berry bushes to buy, which will produce quickly. 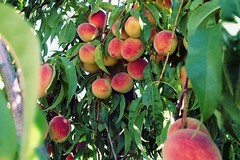 Adding fruit trees and other fruit bushes will take a few years before you see results. To plan for the future make a plan of your yard or land. If you replace older shrubs with berry bushes and other fruit bearing shrubs you will add to the environment and save on the cost of food at the same time. When removing older bushes see if anyone might like them. Community centers, parks and schools might be able to transplant them and renew their vitality. You will want to dig up the area a where the bushes were and add compost to enrich the soil. It’s also wise to split any berry bushes and fruit bushes up on the property. By planting bushes in full sun and in partial sun beds you can eliminate some of the natural pests. Just be sure to keep feeding the bushes and garden areas compost and you will have plenty of fresh fruit and vegetables in no time. As your garden and berry bushes begin to produce swap extra produce with your friend and neighbors. Growing you own fresh produce means healthier food for you family and less of a strain on government farms that run large farm equipment. You also know the produce will not be polluted with strong chemicals.